While there may be no direct feature to collect donations in Cart66 Cloud, it is definitely possible and very easy. In this tutorial we will outline the things you can do with Cart66 to collect user-defined donations and then show you exactly how to set it all up in 7 very simple steps. There are several ways to collect donations. 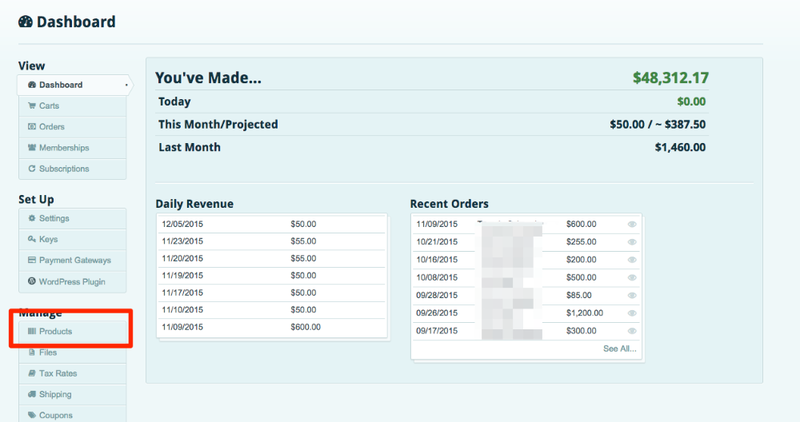 Some users like to enter their own amount (as outlined in this tutorial), some like to choose from a set list of amounts and then some like both options with the ability to make those amounts recur each week, month or year. 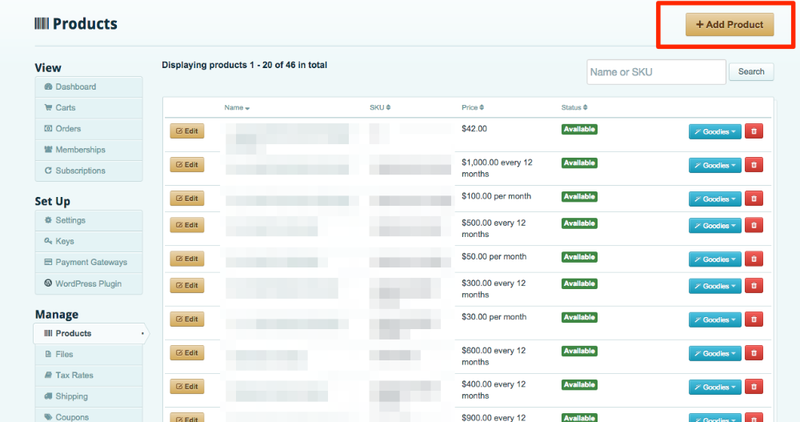 In this article, we will cover setting up a simple donation product using User-Defined Pricing where the customer can enter the amount they would like to give. This is particularly useful for some companies more than others, depending on their giving amounts, but it is also useful to send out invoices (we’ll cover this in a future tutorial). Step 3: Enter a product name. I like to use "Donation Product (custom amount)” or the like for this since we are using User-Defined Pricing but you can all it whatever you wish. Same for the SKU. Use whatever works best for you but be sure to use something that make sense and is cohesive with the product name. 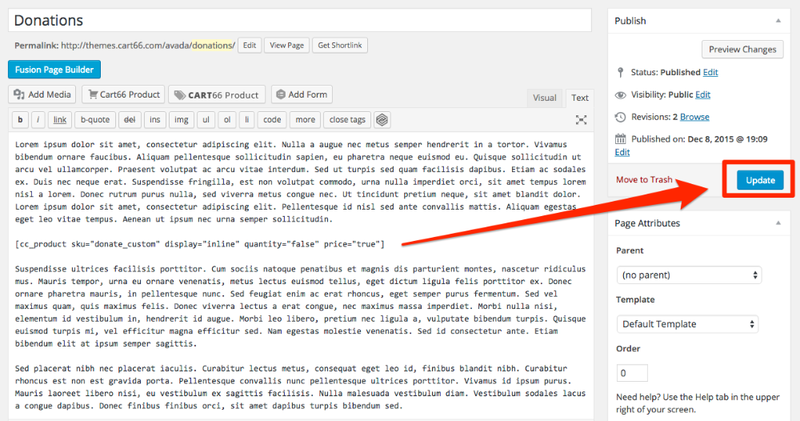 We’ll use “donate_custom” for the SKU in this example. 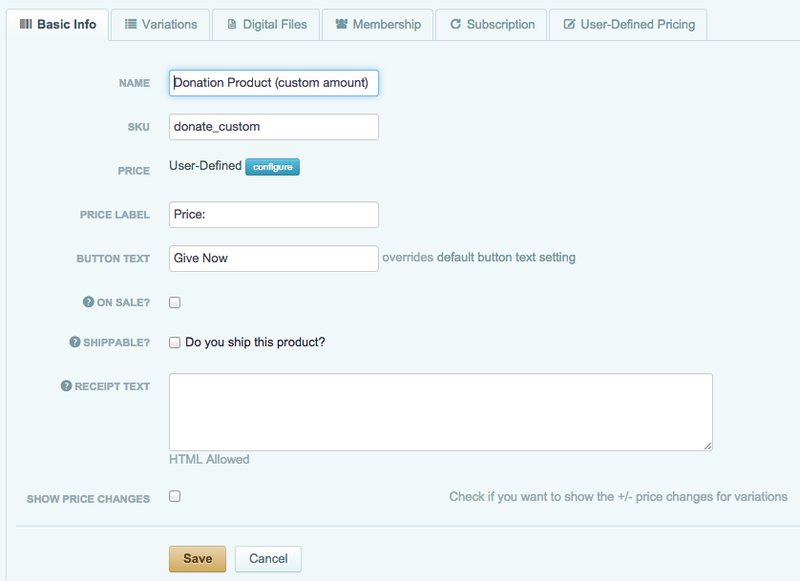 Also, I like to add some custom text for the button since we know users are going to ONLY donate with this product. Give Now would be a good action word to use for this and probably help with conversions. 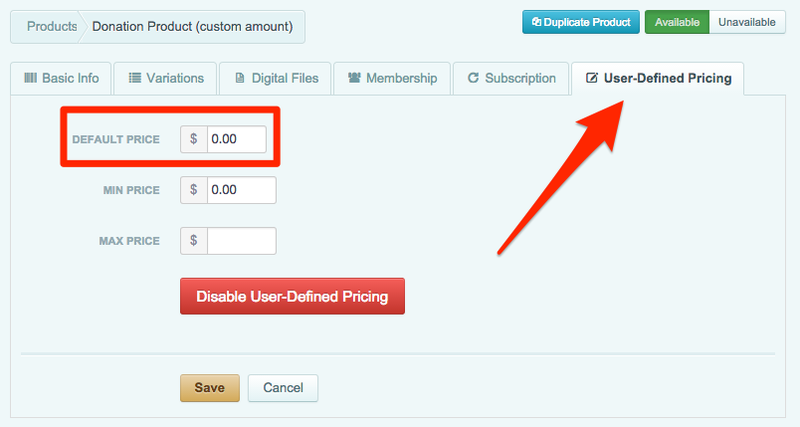 I like to set the default price to $0 but it can be set to whatever amount you wish. 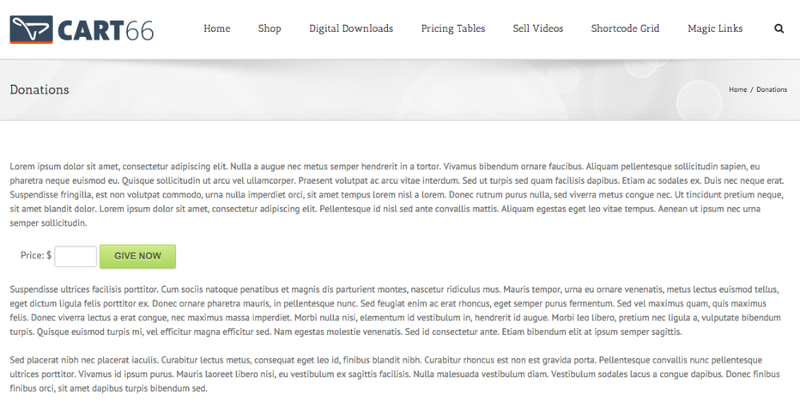 Note: a default price is required or you will get an error. This will take you back to all of your products and you are now done with adding the product to the Cloud so it’s off to WordPress we go! 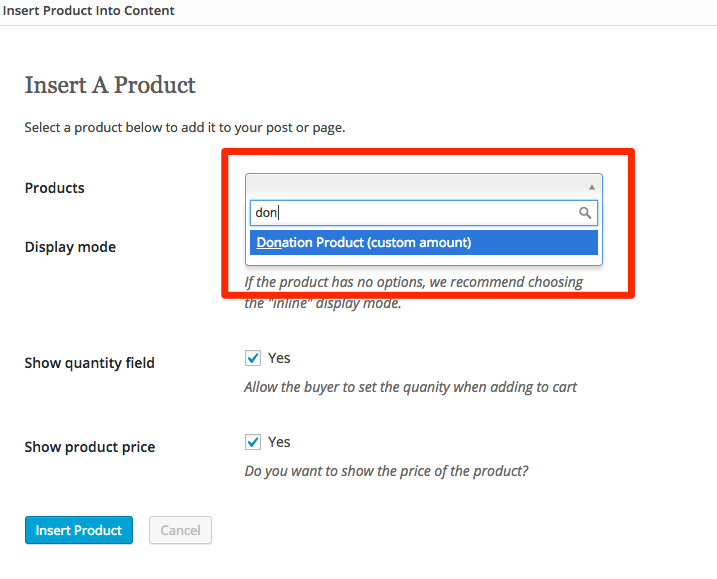 Step 6: Click that button and it will pull up a search feature where you will need to type in the first few letters (or any) of the product you just created and click Insert Product. It’s preference, but I like to uncheck Show Quantity Field and uncheck Show Product Price. Congratulations! You have now created a donation product where users can enter the amount they wish to give and it is inserted into your WordPress site so users can start donating now in just 7 easy steps. This should take about 2 minutes or less!